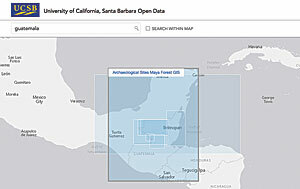 The UCSB Open Data site provides geographic and thematic search. The University of California, Santa Barbara (UCSB) Open Data site provides spatial views of scholarship that give the campus community new perspectives on research. The community now has a better understanding of where in the world research is happening and what that research is about. UCSB, in partnership with the UCSB Library and Esri, launched the site to showcase campus research. For the first time, datasets and publications across campus departments—such as marine biology, archaeology, and political science—are geographically referenced, discoverable, and accessible through one platform. An Esri app showcases open access research theses and dissertations, organized in topic spaces. In the 1990s, the University of California, Santa Barbara, advanced the vision for a spatially enabled digital library through the Alexandria Digital Library project. The goal was to provide access to diverse materials with functionality for spatiotemporal search. Beginning in 2015, a team of academic researchers revived this vision by making their published datasets and papers spatially discoverable. This effort was supported by the UCSB Library, the Center for Spatial Studies, and the Spatial Discovery Fund. Research materials that range from imagery and scanned environmental impact reports to dynamic citizen science data are now available through one search interface. Since the site’s creation, more than 115 datasets have been exposed. These datasets include data about the campus, such as layers from the university’s Interactive Campus Map, along with feature services, reports, and imagery used by campus researchers. The UCSB Open Data site bridges disciplines. It identifies areas of the world for which research data is available, regardless of the discipline or data format. Research data is often organized by discipline (e.g., biology data portal) or theme (e.g., art catalog). Data is less likely to be described and organized spatially. This is a missed opportunity. The spatial organization of campus research cuts across disciplines and formats and offers interdisciplinary views of campus scholarship that promote collaboration. For example, campus researchers from several departments work in the Mesoamerican region, yet data about archaeological excavations, contested political borders, and land-cover type were not discoverable in one place until recently. Datasets that overlap in their geographic extents are now discoverable. This encourages data sharing and linking across disciplines. Relevant publications or other documents that reference the datasets are now also linked to the datasets. This additional context aids in discovery. To support this effort, the authors developed a protocol that allows researchers to provide key metadata elements to geographically reference their resources, making observation locations explicit. In this way, diverse resources hosted across various university repositories can be made spatially discoverable. ArcGIS Open Data supports a wide range of data formats, including URL links to externally hosted content and nongeographic formats, such as documents, images, and tables. Once described spatially, these datasets referenced in research papers are indexed and made discoverable alongside traditional spatial data. 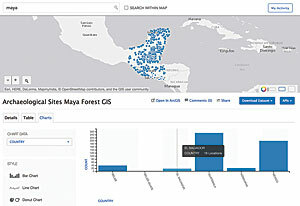 Because all formats contributed by researchers are supported by ArcGIS Open Data, they are also amenable to exploration and analysis in various web-based geographic information systems. 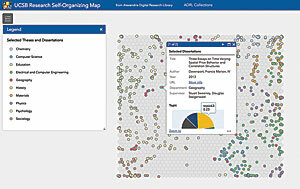 Access and contributions to the open data site are mediated by ArcGIS Online. Users do not need credentials to browse, download, or manipulate data from the site. To contribute, researchers from the campus community follow a simple and extensible workflow to describe and expose their research as data services. This approach also offers a more dynamic means of sharing research products, allowing researchers to publish and maintain control of their original material through any means mandated by academic journals or grants while still sharing their research with a broader audience. It also reduces demand for libraries to provide metadata curation and data hosting through repositories. 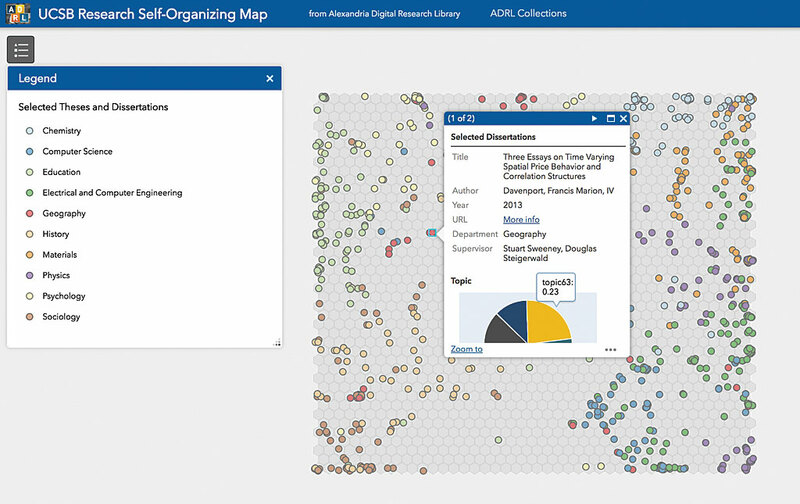 Data shared through the ArcGIS Open Data site increases the visibility of campus scholarship. 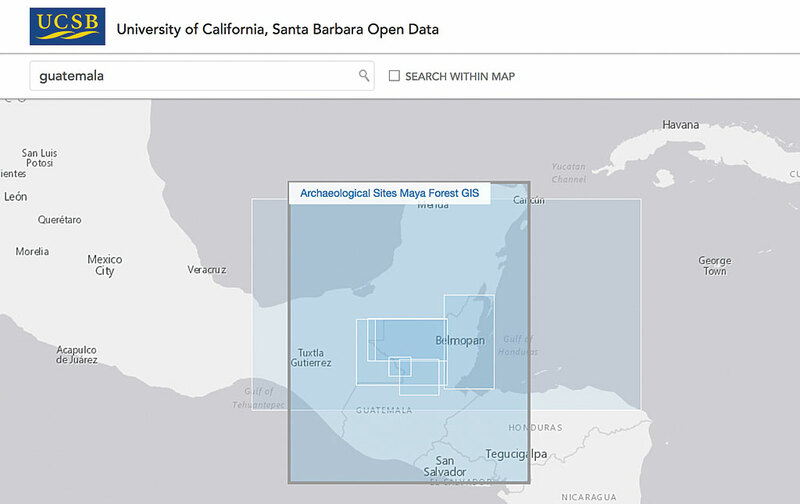 The UCSB Open Data site not only enables geographic views of research but also connects the data to publications about them, allowing users to learn more about the research data in context regardless of which department or repository hosts them. UCSB’s Open Data site acts as a one-stop shop for browsing and accessing data. As the amount of research data available through UCSB Open Data continues to grow, discovery of campus research is also increasing across a broader community. Recent efforts to produce a self-organizing map of campus research based on the subject descriptions of dissertations have yielded interesting insights into clusters of research themes. Expanding the notion of spatial discovery to such topic spaces offers another spatial view of data that is nongeographic. Coupling topic modeling with geographic views of research obtained from geoparsing text descriptions of research enables the spatial discovery of university scholarship through both geographic and topic spaces. For more information, please visit UCSB Open Data or contact Sara Lafia at slafia@geog.ucsb.edu. Sara Lafia, a graduate student in the geography department at UCSB, works in partnership with the UCSB Library and the Center for Spatial Studies on improving the spatial discovery of research data and documents. Her research addresses the question of how to spatially enable discovery of connected data and publications in a setting that allows for mapping and GIS analysis. She is also interested in the application of spatialization frameworks to nonspatial data to gain new insights into contents. Her background is in urban and regional planning, and she has worked on projects with the Region 10 Environmental Planning Agency, the South Coast Air Quality Management District, and the Jet Propulsion Laboratory. Werner Kuhn holds the Jack and Laura Dangermond Endowed Chair and is a professor in the department of geography at UCSB. He is also the director of the Center for Spatial Studies at UCSB. His main research and teaching goal is to enable transdisciplinary research through spatial information and computing. Before joining UCSB in 2013, Kuhn was a professor of geoinformatics at the University of Münster, Germany, where he led MUSIL, an interdisciplinary semantic interoperability research lab (musil.uni-muenster.de). He holds a doctorate from ETH Zurich in surveying engineering and was a postdoctoral researcher with the National Center for Geographic Information and Analysis (1989–1991) as well as with the Vienna University of Technology (1991–1996). He is a cofounder of the COSIT Conference Series (since 1993) and the Vespucci Initiative (vespucci.org) (since 2003).